In this 8-15 day arts integration residency, students focus on a particular time and place in history, relevant to their course of study, and experience life in someone else’s shoes. This program integrates English language arts, social studies, and theater arts. Throughout the residency, students research, write, and perform their own original monologues, short scenes or plays. Working with primary and secondary source documents, other classroom/library resources, and their creative imaginations, students step into history and explore themes and events from multiple perspectives. They construct simple props and costumes, and create an original production to perform for student and family audiences. Each workshop session includes theater arts warm-ups and performance exercises that help students develop public speaking and dramatic arts skills. 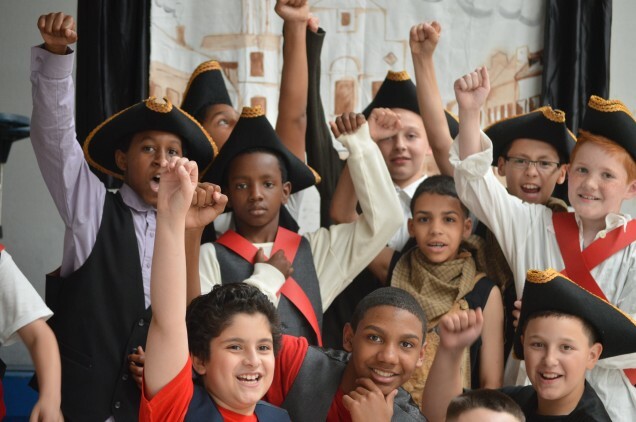 Living History themes can include, but are not limited to: Explorers, The Pilgrims, Immigration, Inventors and Scientists, African American Leaders, Westward Expansion, The Ancient Greeks and the Civil War. For booking availability and pricing information, please email celine@enchantedcircletheater.com or call (413) 534-3789.